CO2 capture and geological storage is seen as the most effective technology to rapidly reduce the emission of greenhouse gases into the atmosphere. Up until now and before proceeding to an industrial development of this technology, laboratory research has been conducted for several years and pilot projects have been launched. So far, these studies have mainly focused on transport and geochemical issues and few studies have been dedicated to the geomechanical issues in CO2 storage facilities. 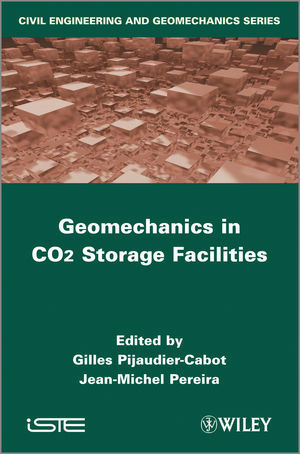 The purpose of this book is to give an overview of the multiphysics processes occurring in CO2 storage facilities, with particular attention given to coupled geomechanical problems. The book is divided into three parts. The first part is dedicated to transport processes and focuses on the efficiency of the storage complex and the evaluation of possible leakage paths. The second part deals with issues related to reservoir injectivity and the presence of fractures and occurrence of damage. The final part of the book concerns the serviceability and ageing of the geomaterials whose poromechanical properties may be altered by contact with the injected reactive fluid. Gilles Pijaudier-Cabot is Professor at University of Pau and Pays de l'Adour, Pau, France. Jean-Michel Pereira is Reasearcher at Laboratory Navier - Ecole des Ponts ParisTech, Marne-la-Vallée, France.